Switching on. 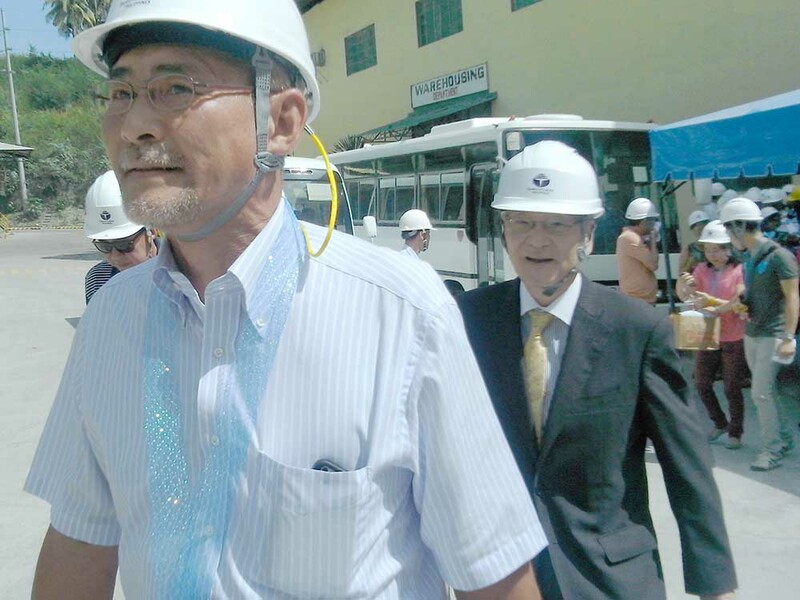 Japan-based Taiheiyo Cement Corp. president Shuji Fukuda switches the ceremonial button on to run for commercial operations the eigth cement grinding finish mill of Taiheiyo Cement Philippines, Inc. in San Fernando, Cebu. SAN FERNANDO, Cebu (Dec. 10, 2015) — Cement consumption in the country this year is expected to reach an unprecedented 24 million tons towards the end of December, according to a top official of a Cebu-based cement producer. Citing figures from the Cement Manufacturers Association of the Philippines (CeMAP), he said demand for cement in the country for the first three quarters of 2015 increased by 14 percent compared to the preceding year. The third quarter specifically etched an “overwhelming” higher mark at 18.5 percent, noted Satoshi Asami, president and chief executive officer of Taiheiyo Cement Philippines, Inc. (TCPI). TAIHEIYO officials from Japan inspect the new TCPI 8K finish mill during its inauguration. “It seems cement demand expansion has accelerated more, and total cement consumption volume in this year 2015 could be more than 24 million tons,” Asami said in his message today during a company milestone. TCPI inaugurated its eight cement grinding finish mill that has increased its production capacity by 70 percent, producing one million more tons in a year from the previous 1.4 million tons capacity. As the company filled in five percent of the country’s expected total consumption this year, it could now answer at least four percent more by next year as the consumption is expected to increase in the next five years. “This hot situation in the construction field makes supply-demand balance of cement tougher than before,” noted Asami. Total cement demand in the Philippines hit 21.3 million tons in 2014, up by 10 percent from 2013 when cement demand overshot for the first time the 20 million tons mark in the history of the Philippine cement industry. “Actually, this amount increased by more than 40 percent compared with 2011 when I moved to the Philippines (to serve as TCPI CEO),” Asami said. He would recall receiving communications from stakeholders, including the Department of Trade and Industry (DTI) and the Department of Public Works and Highways (DPWH), that cement shortage has been noted. Taiheiyo officials and guests witness the 8K mill inauguration. “Taiheiyo proceeded (with taking) necessary counter measures to preempt (a significant) shortage,” he said. 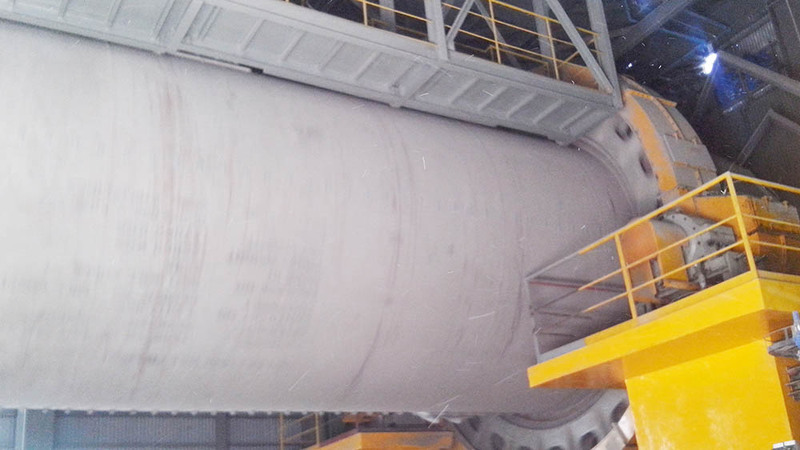 Over the past three yours, Asami reported that TCPI built a new clinker shed, a 4,000-ton cement silo, two additional packers, upgraded the pre-cement grinding system, and doubled with a P270 million investment the capacity of its port facilities to meet the increasing demand. 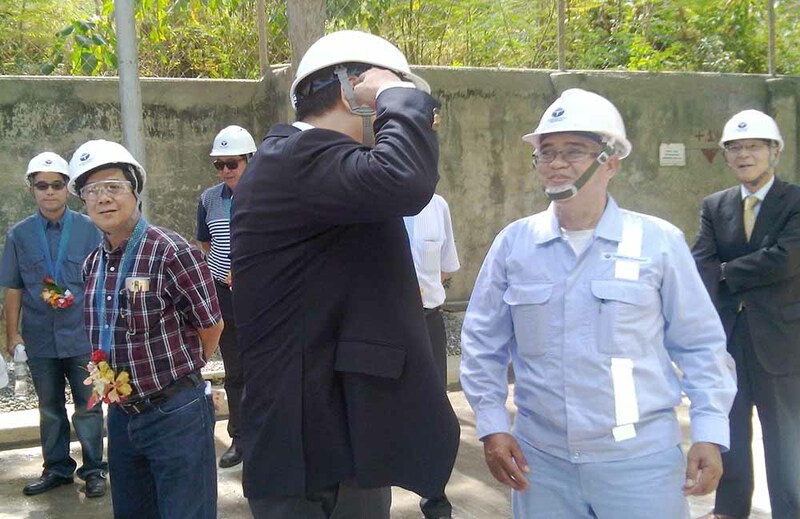 Finally, he added, came the completion of the company’s eighth cement mill expansion project, an investment of P663 million, with the facility now starting to produce 128 tons per hour. The TCPI board decided to pursue the project in March 2014, and it took the company 21 months after to complete it, Asami shared. “We now produce two million bags more per month. Thus, total monthly production capacity of Taiheiyo becomes five million bags,” he declared. CEBU Gov. 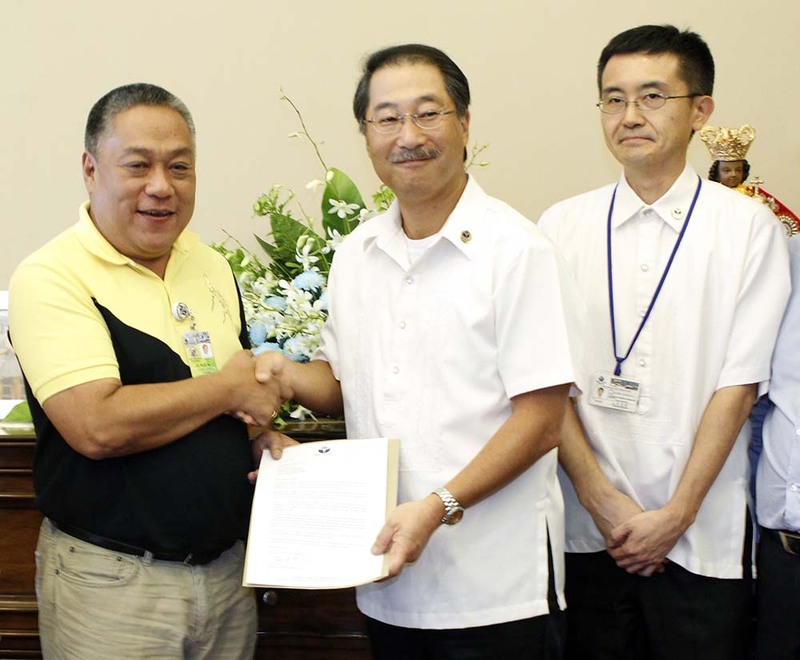 Hilario Davide III (left) is shown in this file photo with TCPI CEO Satoshi Asami and SVP Yasuhiro Yamamoto receiving Taiheiyo Group’s donation for the immediate relief of and rebuilding for the survivors of Super Typhoon Yolanda (Hainan) in northern Cebu. “This will translate to more buildings and ensure a stable supply in Cebu and central Philippines, and further create more jobs,” he said. 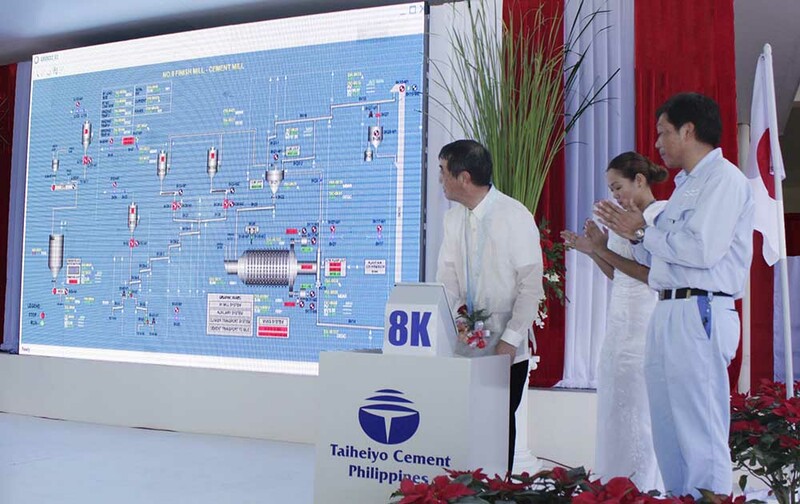 Japanese consul Shigeyuki Hirakawa also lauded TCPI for reverberating more Japan’s trust and confidence in the Philippines’ economy, as Taiheiyo Cement Corp. (TCC) president Shuji Fukuda personally switched on the ceremonial button. Joining him were Junichiro Tanaka and Toshiyuki Hashizume, president and vice president of the Japanese Chamber of Commerce and Industry of Cebu, Inc.
TCPI’s eighth and latest finish mill runs grinding clinker with additives to produce cement products for consumers. This entry was posted on December 10, 2015 by Cerwin in Taiheiyo Cement and tagged 8K, CeMAP, cement, cement demand, clinker, Davide, finish mill, Grand Masonry, Grand Portland, Grand Pozzolam, Grand Premium, grinding system, investment, Japan, Japanese Chamber, San Fernando, supply and demand, Taiheiyo, TCPI.